Welcome to the website of the Beekeepers’ Guild of San Mateo County, California. The Guild provides a valuable community for sharing information, tips and resources, and camaraderie. Experienced members frequently guide and mentor beginning beekeepers. We invite you to attend our next monthly meeting or one of our beekeeping classes. Our site offers many resources for beekeepers: information on our member email group, supplier lists, useful books and journals, and more. For those who are not interested in beekeeping, we also offer information on swarm removal and honey bee colony removal. We always welcome new members, regardless of beekeeping experience. Our membership ranges from seasoned veterans with over 70 years of experience to hobbyists just starting out. We’re an eclectic group of hobbyists, small-scale beekeepers and commercial beekeepers. You’ll also find a range in beekeeping approaches, from the more chemical intensive beekeepers to those who practice organic or natural beekeeping methods. We have members who keep Langstroth hives, as well as a contingent of top-bar beekeepers, and members who prefer to keep a few of each type of hive. For more information on how to become a member, and the benefits of membership, visit our membership page. We are offering both beginning and intermediate classes in 2018. 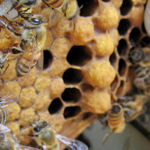 You’ll learn about the equipment and techniques of beekeeping, with an emphasis on keeping bees in urban and suburban settings. The Beekeepers’ Guild of San Mateo County holds meetings the first Thursday of each month at the Trinity Presbyterian Church, 1106 Alameda de las Pulgas, San Carlos. Meetings feature experienced members or special guests who talk about honey bees and/or beekeeping. Meetings start at 7:00 pm; additionally, at 6:30 pm the BEEginner’s Corner meets for informal discussion on beginning beekeeping. Help us determine which beekeeping practices give the best results in our area! Just how busy are bees, anyway?